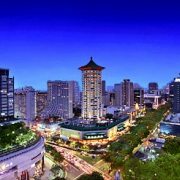 Located in the heart of the business, shopping and entertainment district, the award-winning Singapore Marriott Hotel is known for its iconic towering green pagoda on famous Orchard Road. Our 5-star Singapore hotel boasts 393 guest rooms including pool terrace rooms and splendid suites. Recently refurbished to offer a new level of luxury, our guest rooms feature LCD high-definition televisions, high-speed Internet, in-room safe and Marriott Revive bedding. After a busy day, unwind in our swimming pool and spa. At any time, visit our 24-hour fitness centre for an energizing workout. Culinary delights abound at our award-winning restaurants including Crossroads Cafe, Wan Hao Chinese Restaurant and Marriott Cafe. Whether planning a meeting, conference or wedding, your event will be a memorable success at the Singapore Marriott Hotel.